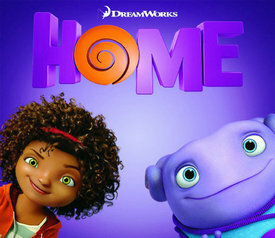 Kellie: Hey Brian, have you seen the new trailer for “Home“? Brian: Is that the new Dreamworks film? Brian: Yeah, I did see that. I’m not all that interested. I’m more of a fan of Pixar movies. Kellie: Oh, but you do like animation? Brian: I do, yeah, I really like “Toy Story“ and “WALL-E.“ I think those were really good. I feel like those kind of set the bar for animated films. Kellie: Well, this one… some of the voice-overs are really great. There’s Jennifer Lopez. Brian: Yeah. Rihanna as well, I believe. Brian: Yeah, I feel like most of their films are all about the outcast, and I really like the themes that Pixar movies play with, like growing up. Kellie: Well, I can see that. I guess you have high standards. Brian: It’s just to each their own. I don’t think necessarily one’s better. Kellie: Well, I think it’ll be good. So if you want to go see it, I’ll buy your ticket. Brian: Alright, I’ll buy the popcorn.